The recipe I choose to feature from this month’s cookbook of the month seemed easy enough. All ingredients that are common in most grocery stores and the recipe seemed fast and easy. When I was planning out my weekly recipes last week and looking over what recipes I was going to make for the cookbook of the month features I saw this recipe for trout. It sounded easy, fast, and yummy and Eric and I really don’t eat much fish because it can be expensive, it doesn’t keep well for leftovers, and Eric is just not that big a fan of seafood. Well I decided fish would be a good change to our normal chicken, pork loin, and ground beef/turkey dinners. But of course my grocery store did not have trout (is there a season for that?) but was having a great special on tilapia, a fish that Eric likes. I then went to find the ‘blue cornmeal’ that the recipe originally calls for and my grocery store did not have any of that either. I could have sworn that I have seen it there before. Through out the week as I passed other grocery stores, Wal-marts, and Super Targets I checked for this blue cornmeal. But none had it. 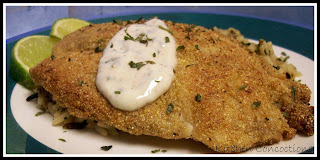 I decided I wanted to make this fish and have it ready to post for this week’s cookbook of the month recipe and was tired of looking for this darn blue cornmeal when I knew I had perfectly good yellow cornmeal at the house. So this fast and easy fish recipe quickly became a huge nuisance on the hunt for the blue cornmeal. I decided to use the regular yellow cornmeal I already had and I really don’t think the flavor was changed by me using yellow cornmeal instead of blue; it just would have had a more unique presentation. The other ‘hiccup” I had with this seemingly simple recipe was that it calls for ground coriander. The lovely spice rack that Eric gave me for Christmas, which came with 25 spices, so I figured I had this spice at home and did not need it. I was right that my new spice rack had it; however it was not ground up. I don’t have a coffee grinder and so I had to try and smash the coriander with my hands still leaving pretty much in large chunks. Finally I was able to whip up this entree and despite all the ‘issues’ I had, and it turned out delicious. The whole time Eric ate, he would take a bite and say how good it was take another bite and say how great it was…. you get the idea. If you know it got that response it must be good. Other recipe notes: I halved the original recipe because I don’t like left over fish. The halved amount was perfect for us and made two tilapia filets. You might be able to find blue cornmeal at Whole Foods or Sprouts (I don’t have one relatively close by or I would have tried there) or even a Fiesta Food Market, or other specialty store. The next time I make this recipe (and there will be a next time) I am going to try and go to one of these specialty grocery stores and try and get the blue cornmeal because I am anxious to see how it looks after it is cooked. Combine sour cream, cilantro, lime juice, cayenne pepper, 1/4 teaspoon salt, and 1/8 teaspoon black pepper in a bowl. Stir to mix well and set aside. Combine cornmeal with the coriander and cumin in a shallow dish. Season fish fillets on both sides with the remaining 1 teaspoon salt and 1/2 teaspoon black pepper. Then dredge the seasoned fish fillets in the cornmeal mixture, shaking off any excess. Heat 2 tablespoons vegetable oil in a large nonstick pan over medium-high heat. When hot add 1 tablespoon butter. When butter is melted and 2 fish fillets. Cook on each side until golden and crisp, approximately 2-3 minutes per side. Remove from pan and repeat with remaining fish fillets. 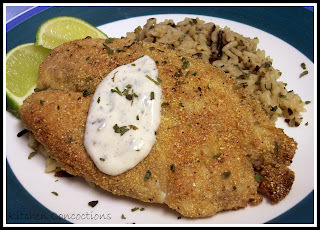 Serve each fillet with a dollop of the cilantro-lime sour cream and garnish with lime wedges.